Per Deadline, Matthew McConaughey, whose surging career has led him to such recent critically acclaimed films as Magic Mike, The Lincoln Lawyer, and Killer Joe (although he mostly played second fiddle to Clarence Carter in that) is in negotiations to lead Christopher Nolan’s upcoming science fiction movie, Interstellar. If he were to accept the role, that might be one of the only pieces of information we get about the film until a trailer hits, given Nolan’s borderline compulsive propensity for secrecy. But the premise of the suddenly-not-half-assing-his-way-through-romantic-comedies McConaughey toplining a wormhole adventure story is an exciting one. With Nolan’s pedigree and the space trappings, the 2001: A Space Odyssey comparisons will likely abound, but hopefully the Inception director will subvert our expectations and reveal his real plans: Melba Toast in Space. Owen Evans points to the popularity, among international audiences, of German films that “represent the totalitarian past” and argues that such films might “comprise a specific genre that proves very attractive to cinema goers: the German totalitarian thriller, we could perhaps calls it” (New Directions 58-59). Using Downfall and Sophie Scholl: The Final Days as sources of evidence and examples, create your own description of “the German totalitarian thriller.” What are its characteristics? Is that label too reductive, or does it get at important psychological components of these films? Feel free to draw upon the class texts as well as the movies. Is there such a thing as a “German totalitarian thriller,” as suggested by Owen Evans in New Directions in German Cinema? The answer to that is not definite. Rather, the most confident reply one could have to that question is, “Partially.” Films like Downfall and Sophie Scholl: The Final Days feature elements inherent in thrillers of all stripes—seemingly constant peril awaiting the characters at every turn, central characters who represent a semblance of “the common (wo)man,” a strong focus on the psychological impacts of the characters’ predicaments, among others—but these two movies lack the fictional plot thrust, the action-adventure qualities common in more traditional thrillers in the Alfred Hitchcock mold. These examples are character studies not quite masquerading as thrillers, given the features listed above, but still they fail to reach thriller status all the same. To enter that Hitchcock mold, one must first understand the fundamentally artificial idea that is suspense. This is not to say being artificial or contrived is necessarily bad, but simply put, it must be created. To paraphrase Hitchcock himself, suspense is the audience knowing a bomb is hidden, ticking away underneath a table while the characters onscreen remain oblivious. The suspense lies in the waiting, the moments of not knowing how the characters in whom the audience has conceivably placed their empathy will get out of the situation. Both Downfall and Sophie Scholl run into a severe problem here: History. Even (especially?) foreign audiences know that Hitler spent his last days hiding in a bunker before ultimately committing suicide. Perhaps a little more obscure, but still widely available knowledge is the fact that Sophie Scholl and other members of the White Rose resistance movement were captured and put to death as traitors to the German state. Without the element of surprise—“What will happen to them?”—provided by fictional plots, suspense in the traditional sense is nearly impossible to achieve in these films. What make these movies “thrilling” are their introspective looks at the ways these characters deal with the situations in which they find themselves. Downfall does not have much plot, per se, as most of the typical rise-and-fall story structure happens before the start of the film. From the film’s beginning, the audience—and most Nazi members—knows Hitler is finished; the Allies are practically knocking on the bunker door. What follows is a character study in self delusion. Seeing Hitler not only appear almost fatherly to Traudl, his secretary, but have moments of weakness is engrossing. It’s an intimate look at someone who has reached mythical status in the eyes of so many. In its own way, its sense of discovery, of tearing away the artificial, terrorizing cloud that surrounds the man is thrilling. But it is not suspenseful. It has no way to be. There is no way for Hitler to get out of the situation—furthermore, nobody would want him to avoid his fate—and the first moments of the film show an elderly version of the empathetic Traudl reflecting on her time serving the Fuhrer, so the audience knows she survived the downfall of the film’s title. Because of the historical restraints, there can be no gripping, “What will happen next?” moments like the attempted-assassination-by-airplane in Hitchcock’s North By Northwest or the classic sewer showdown in Andrew Davis’s The Fugitive. The only scenes to approximate a similar “pulse pounding” nature in Downfall all exist in the quieter moments, when Hitler allows himself time to think critically, to contemplate his inevitable defeat. The wait for him to snap back into howling denial is frightening, to be sure, but it exists as an internal character trait, not a plot-driven moment; for the context of the film, this is better than an external event, but it still avoids what makes a thriller, well, a thriller. Sophie Scholl succeeds to a larger degree than Downfall in fulfilling the requirements of a thriller, but those are quickly spent in the film’s inciting incident: The anti-Nazi flyer distribution at a college that leads to the arrest of Sophie and her brother. Once the siblings have placed what would be a sufficient amount of flyers at strategic spots in the university’s main hall, they are left with a couple stacks of leftovers. The decision to go back and push the remaining papers from a balcony is the film’s only true “thriller” moment, an instance of cinematic contrivance: A plot device included to heighten the drama. From there, the film falls into a similar character study style as Downfall, in which director Marc Rothemund shows Sophie’s youthful courage—some might say stupidity—in standing up for her beliefs against the totalitarian regime in which Evans situates his argument. It peels away layers of the Nazi ideology through Sophie’s arguments with her captors, and that is more important than artificially stimulating the audience with thriller trappings anyway. But again, it lacks what is classically understood as filmic suspense. For there to be a true “German totalitarian thriller,” filmmakers would need to worry less about historical figures, biopics, and the like, and focus on the themes and lessons present during the reign of the Third Reich. These rhetorical screenwriters and directors should conjure their own characters, fill them with their own personal obsessions—much like in any imaginary story—and plug those people into the Nazi era, free to do whatever they want with those characters. That way, the storytellers can concentrate on crafting a yarn, inviting the audience to participate in the more “fun” aspects of filmmaking by scaring them, making them laugh, and awing them with the exploits of someone they do not know. This would provide the taste and texture of the more staid productions mentioned in this essay, but without the restrictions of adhering to the truth of history. Historically accurate films like Downfall and Sophie Scholl cannot accomplish that because they are not free to play with true-life figures the way a filmmaker would with a created character. This week’s edition is a little bit of cheating, as I saw The Playroom this weekend while I volunteered at the Citizen Jane Film Festival in Columbia, Missouri. A period piece about a seventies family falling apart, the movie is highlighted by great, pained performances, especially from John Hawkes and his Deadwood costar Molly Parker as a feuding and drunken married couple (serves them right for going behind Seth Bullock’s back in a betrayal of epic proportions), and Olivia Harris as their eldest daughter; however, Dyer gets phenomenal work out of all the young actors. A claustrophobic, one-house setting turns up the familial tension to uncomfortable levels. It may not be a happy crowd pleaser, but it’s a well done film that the director, Julia Dyer, said will be available on Netflix, VOD, and other streaming services this February. See it and help a talented independent filmmaker get the clout needed to continue her career; we need more people with a knack for working with actors in such a masterful way. Formalist analysis is not something I have spent much time doing on this website. I understand a large portion of it and I often care more about story, theme, and character. I’ve often looked down on the nuts and bolts of filmmaking, probably to my own detriment. 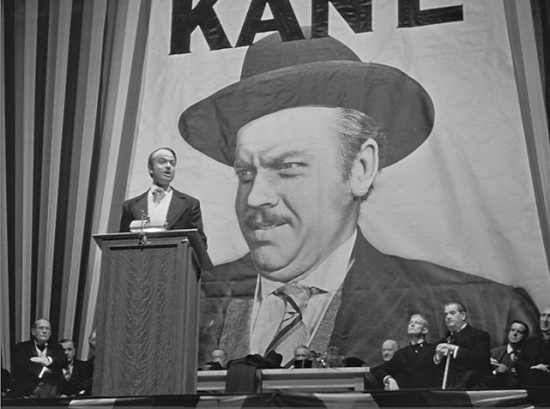 Due this past Monday in my film class was a formalist analysis of a scene of my choice from Citizen Kane. I knew I could do it and it would not have been a taxing thing on me, but I didn’t think doing so would expand my appreciation of the film to such a degree that I would now list it among a favorite — as opposed to simply being on the “greatest films I’ve ever seen” list. Going shot by shot through this sequence opened my eyes, and I had a blast doing it. In the future, I want to integrate more of this style in my posts. This sequence, which lasts three minutes and four seconds over 19 shots, covers the time in Charles Foster Kane’s life when he runs for governor of New York. This is a time of immense optimism, which will be shattered by Kane’s own hubris and womanizing. It largely focuses on a rousing speech given by Kane to a crowd of supporters. Shot durations are listed in parentheses after each shot description. Shot 1 There is a long shot of man speaking on ramshackle podium clearly built in haste. He is elevated above the crowd, the focus of their attention. The crowd members, many of whom appear to be of the blue-collar variety in plain jackets and hats, all look up at him, hanging on his every word. A street light burns bright next to the speaker, a Kane supporter, which can be an indication that Kane is the bright hope for the state. “Kane For Governor” signs are pasted all over the walls of what appear to be an alley where this rally is taking place; this indicates the Kane campaign is willing to go anywhere and everywhere to get their message to the people. The camera, which is on a crane, mimics the feeling of a dolly-in on the speaker as he talks about Kane being a “fighting liberal,” among other things. Shot 2 There is a cut from the middle of the speaker’s speech to a long shot of a huge poster of Kane’s face and Kane’s voice continues the sentiments of the street speaker. 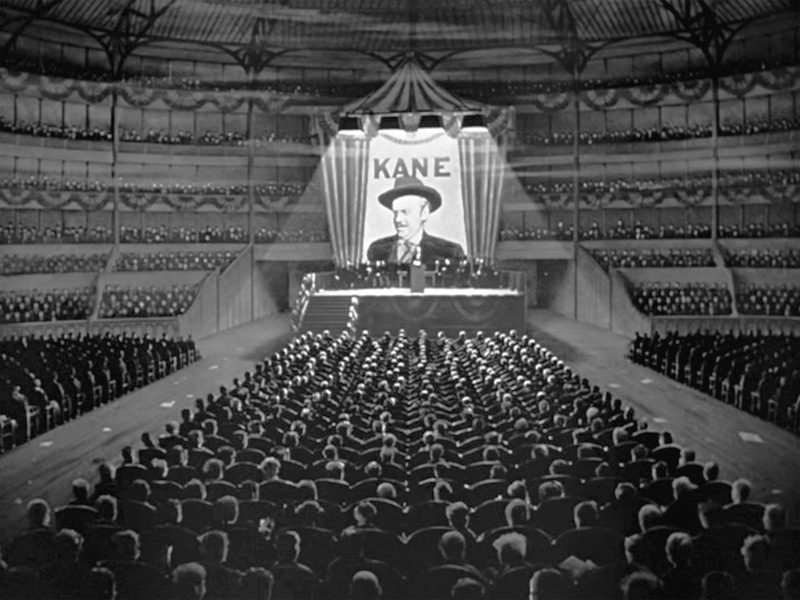 The camera does a slight pan left and tilts downward to show Kane at a podium giving a fiery speech. Various men in nice suits sit behind him in a slight arc, staring at him; he is clearly the most important man in the room and perhaps the world. Shot 4 Dissolve to a long shot of Kane, again directly centered, continuing his speech. CAM pushes in as Kane gestures grandly, his hands spread wide. The camera continues its dolly-in and eventually approaches from a slightly left-of-center (perhaps in relation to Kane being the “fighting liberal”?) perspective; as it gets closer, it tilts up, again displaying Kane’s power and importance. Shot 5 Cut to Kane’s son and wife, Emily, in a tight medium shot. His son is standing, excitedly watching his father. Emily appears both nervous and blasé about what’s happening before her eyes; she couldn’t care less about the speech, but she doesn’t want her son to be an embarrassment. Emily tells the boy to sit, and he dutifully does, but his eyes remain wide with pride in his father. In the background are a few visible bodies to imply Kane’s family is among a huge crowd, when in fact this is a small set. Behind those headless bodies is emptiness, not more people; a trick of scale Welles uses multiple times through the rest of the sequence. Shot 6 Cut to low angle of Kane, this time from the right-hand side of the stage. Shot 7 Cut to a medium shot of Kane from the same side of the stage, but this time in a straight-on-to-slightly-high angle. He gives a cocky but gregarious vibe, the type of politician that usually wins (Ronald Reagan, Bill Clinton, Barack Obama). Shot 8 Cut to high-angle shot of Emily and their son. She looks on with dead eyes while he waves excitedly. Shot 9 Cut to Kane sending a quick salute to his son (a faulty eyeline match because Kane should salute to the other side of the stage). Shot 10 Cut to Jedediah, Kane’s business partner, lit brighter than the extras next to him (he is important and they are not) looking on at his friend quietly. Shot 11 Cut to that same highish, to-the-right angle of Kane at the podium. He walks to the side of the podium and the camera pans right to follow him. Shot 12 Cut to Mr. Bernstein, another Kane friend and business partner, in the crowd (again with more light hitting him than the extras, and placed in the center to draw the viewer’s attention) clapping his appreciation and support for his boss and friend. Again, like the shots of Kane’s wife and son and the one with Jedediah, there are actually few people in the shot, but with enough cutting and sound amplification of the audience’s applause, the speech appears to be happening in a much larger space than it really is: A Hollywood soundstage. Shot 13 Cut to Kane’s son and Emily, again in a medium shot, and a much more straight-on angle than before, sitting and watching. The boy asks if his “pop [is] governor yet,” and his mother reassures him, “not yet,” in a way that implies he will be. Shot 14 Cut to Kane again at the podium. His joke, “I would make my promises now if I weren’t too busy arranging to keep them,” makes the audience burst into confident laughter. Shot 15 Cut to Jedediah clapping and laughing at the joke. Shot 16 Cut to high-angle shot of Kane at the podium in a long shot and oriented to the right. The pulling away of the camera implies Kane is being watched carefully while making threats to Boss Jim Gettys, his chief political foe. The camera zooms on Kane as he promises to convict Gettys of his political crimes. Shot 17 Cut to a man in trench coat watching from a faraway balcony at a matte shot of the crowd cheering Kane onstage, foreshadowing that Kane’s promises will not be kept. The man puts on his hat and walks away while Kane’s speech ends and music begins to play amid loud cheers and applause from the crowd. Shot 18 Low angle from the left of Kane shaking hands with his supporters. They are clearly important, upper crust men, as shown by their top hats and tails. The camera dollies left as Kane moves across the stage, shaking more hands as he goes. The camera dollies back slightly as he descends the stairs from the stage to meet the press, and a flashbulb goes off. Shot 19 Dissolve to a straight shot of Kane again in the center, walking toward the camera, which does a reverse dolly track through a crowded hall of supporters and well wishers. His son rushes toward him and Kane takes him in his arms. Emily meets the two of them as the camera stops tracking and another flashbulb goes off. I’ve been slow to appreciate Terrence Malick’s work. Last spring I saw the trailer for The Tree of Life and couldn’t stop thinking about it. It looked so mysterious and abstract that I felt it necessary to study his filmography. I watched his four previous movies — Badlands, Days of Heaven, The Thin Red Line, and The New World — and only truly enjoyed The Thin Red Line. The voiceover use bordering on excess and the lingering shots of nature were intriguing if difficult to connect to. Then last week I was able to see Tree of Life on a big screen — the first time I saw it was on a small TV in the afternoon, much like the rest of his movies (not exactly a prime viewing situation) — and everything clicked in that greater medium. When immersed, the poetry of the voiceovers doesn’t feel abstract; it enhances the beautiful imagery washing over the screen. And with Malick’s late-career surge of productivity, he has showcased To The Wonder on the film festival circuit the last couple months to gain a distributor. It may not have received the warmest of reactions, and I have only the vaguest of understandings as to what kind of thematic or plot ground the film covers, but if I have the opportunity to see another Malick on a big screen, I’m going to do it. Now, someone pick it up and release it.